멘도사에서 여행하기 편리한 호텔을 찾고 계신다면 Hotel Raices Aconcagua 만큼 좋은 곳이 없습니다. 이곳에서 생생한 도시의 모든것을 쉽게 즐기실 수 있습니다. 호텔에서 손님들의 즐거운 관광을 위해 도시 최고의 명소를 소개합니다 : 무세오 시립 드 아트 모더노, 리오스 안디노스, 티트로 퀸타닐라. Hotel Raices Aconcagua에는 다양한 시설이 있어 멘도사에서의 시간을 풍요롭게 해줍니다. 호텔의 손님들은 내부에 있는 전 객실 무료 와이파이, 24시간 프런트 데스크, 여행 가방 보관, 주차장, 회의시설 같은 시설을 즐기실 수 있습니다. Hotel Raices Aconcagua 고유의 분위기가 모든 객실에 반영되어 있습니다. 또한, 에어컨, 난방, 모닝콜 서비스, 책상, 미니 바 등이 대부분의 객실 내에 구비가 되어 있습니다. 헬스장, 사우나, 실외 수영장, 마사지, 정원 등을 포함하여 여가시설이 잘 구비되어 있는 호텔은 일상 탈출하여 편안한 휴식을 즐길 수 있게 꾸며져 있는 곳 입니다. Hotel Raices Aconcagua 숙박시설은 멘도사에서 편안하고 매력적인 곳을 찾는 여행객들에게 이상적인 장소입니다. We were travelling for our honeymoon and when we booked we asked for a larger room to accommodate two big suitcases. The clerk at reception basically told us that the best that he can do is give us a room with one queen bed. (btw, when we reserved we chose the one queen bed option to begin with so he was proud to offer us something we already had...) The price seemed ok for the type of hotel, however, when we got into the room we were a bit underwhelmed. The room was on the small side and the wifi on our floor was inexistent!! We complained several times at the front desk but nothing was done. They should not even advertise wifi for their rooms...we tried to connect to other wifi from a lower or higher floor without much success. Basically the only way to send an email was to go downstairs to the lobby. One last thing worth noting is that the shower had only almost boiling water and the cold tap was not working. The hotel is simple but very nice. You can easily find a "better" place but not for the same price. The staff is friendly and most of them are fluent in English and happy to answer any question. The city centre is a great location - there is a small park just down stairs and you can find everything which is needed in a short walking distance. The food (breakfast) is very basic. The Hotel Raices Aconcagua is a very nice place to stay in while traveling to Mendoza. The location is great - very central, close to many bars, cafes and shps. In a walking distance, just two to five minutes, there are few parks. The rooms a re simple and clean and the staff is very friendly and useful. It is great to be located in the city centre. the hotel was very comfortable, large well equipped rooms. breakfast was adequate, although not a lot of variety. the underground parking was very tight, so unsuitable for large cars. friendly staff. A nice hotel with a good restaurant. A room was small and had an old TV, but clean and comfortable. Perfect location to walk around Mendoza. in this modern hotel you feel at home. good and friendly service. some people speak englisch fluently. they were helpfull with information about how to make excursions, visiting wine yards, go rafting, hiring a care, etc. we did use internet many times, free of costs. the room was clean and light. next to the garden was a small restaurant were we did have a good lunch once. the location is very central, and quiet! good value, good breakfast, pleasant design, very good restaurant. great location, nice staff, easy to use, good parking (and it's of t free!!). My only complaint is the quality coffee at breakfast. Much more like a North American hotel than South American. After a long drive it was great to have parking provided at this very well located hotel. The next day we had easy access for walking in the plazas and streets of Mendoza. Just a comfortable well situated hotel. 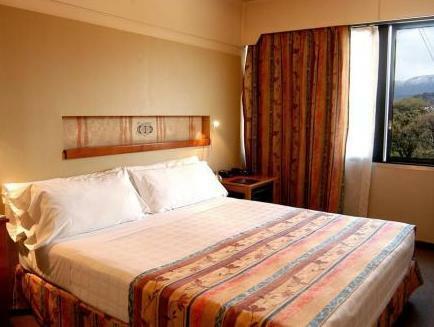 Hotel Aconcagua is very nicely situated in the center of Mendoza. Very professional, helpful and polite staff. They had good english skills! The breakfast was rather good compared to other hotels in South America. The hotel has a spa, which was rather old but worked okay. They offered massage therapy for about US$50. The therapeut was highly skilled. Would recommend this hotel. Location and extended breakfast hours on weekend. Could have been a bit cleaner, carpets in hallways stained. We enjoyed our stay at the Aconcagua. The staff were very friendly and accommodating. Breakfast was very good. Nice pool and lovely arbor area off the dining room. We appreciated the extended breakfast hours on weekends. The location was good with lots of restaurants and sidewalk cafes nearby. Short walk to Plaza Independencia, Plaza de Espana and Plaza Italia. -some of the staff not always to friendly. The luggage boy was not interested in helping us...since we had rucksacks. Not even the fact that I was looking at him for help seem to bother him... nice. -The location and the price are correct. -The hotel lobby is nice, but the lift and the rooms are less "shiny"
Staff is kind. Beautiful and very comfortable lobby. Nice restaurant. Good conference amenities. Air-conditioning was not on. Just after many people complained. Rooms are not so comfortable for a 4-star hotel. Anytime I called before to confirm my reservation I was kindly assisted. When arriving, staff maintained this kindness. The biggest problem was that weather was warm and air-conditioning was not on, and they explained that they only put it on after a fixed date. Room was reasonable. Conference rooms and lobby very good. Als Vorteil finde ich auf den 2. Stock Schwimmbad, was in Januar in durchnittliche 30.Grad Temperatur sehr angenehm ist.Service war gut ( entspricht 4Sterne Hotel. Besonderes in der Rezeption die Angestellte waren behiflich. Brreakfast fuer argentinische Verhaeltnisse aussreichen. Wir waren mit drei Personen im Hotel untergebracht, weil wir von Mendoza aus eine Bergfahrt in den Anden unternehmen wollten. Das Ambiente des Hotels ist recht ansprechend und gerade deshalb hatte ich Zweifel, ob wir als Bergsteiger uns nicht wie "Fremdkörper" fühlen würden. Das war aber glücklicherweise nicht der Fall, weil man auf unsere spezifischen Anliegen eingegangen ist. Dem Personal kann diesbezüglich ein Kompliment ausgeprochen werden. Freundlicher Service, schönes Frühstücksbuffet, Zimmer o.k..
bis auf probleme beim einchecken (prüfung agoda-buchung) dauert relativ lang, ist das hotel sehr zu empfehlen. Gutes klassisches 4-Sterne Hotel im MicroCentro von Mendoza (8 x 8 Blocks) und liegt 5 Blocks von der Shopping- und Hauptstrasse San Martin sowie 3 weitere Blocks von der Fussgängerzone Sarmiento. Der grosse Plaza de Independencia liegt auch nur 4 Blocks entfernt. Die Reception kann Mietwagen vermitteln, es hat aber keine eigene Autovermietung im Haus. Grosszügiges Frühstücksbuffet und nettes kleines Restaurant. Wir waren in Mendoza, um die Gegend zu erkunden. Es war sehr zeitiges Frühjahr, die Rebstöcke fingen gerade an auszuschlagen. Die zentrale Lage ermöglicht einen leichten Zugang zum Innenstadtkern. Es ist alles zu Fuß zu erreichen. Durch den hohen Baumbestand wirkt die Stadt sehr grün. Abends war aufgrund der milden Temperaturen bereits ein Abendessen im Freien zu genießen. Haben uns auch abends stets sicher gefühlt.